Welcome to our research website! Please have a look around and check out all of the cool things we’re working on now. The research in our group focuses on using geochemistry to understand Earth’s past and protect Earth’s future. We study a number of unique systems and use a combination of isotopic and elemental geochemical approaches. To learn more about the instrumentation and facilities we use visit the Environmental Analytical Facility. As ocean pH declines the availability of carbonate ion will also decline. This is an essential building block for organisms who build shells out of calcium carbonate. In our research group we are studying how ocean acidification will impact the growth of carbonate minerals in fish (ear stones) and invertebrates (bay scallop, lobster, and oyster). This research is a partnership with Dr. Michael Tlusty, Dr. Andy Rhyne and Dr. Helen Poynton and was funded by the National Science Foundation (NSF-CRI-OA 1220480 to Hannigan, Tlusty, and Rhyne). The research involves rearing of larvae under controlled pH conditions until settlement age. Otoliths (3 on each side of the head of the fish) are removed and imaged by scanning electron microscopy. Images are then analyzed for morphometrics (shape and size), mineral habit and mineral composition. Students involved in this project include former PhD student Eric Wilcox-Freeburg (PhD 2014, Data Scientist, TenData) and current PhD candidate Robert Holmberg. Holmberg, R.J., Wilcox-Freeburg, E., Rhyne, A.L., Tlusty, M.F., Stebbins, A., Nye, S.W., Honig, A., Johnston, A.E., San Antonio, C.M., Bourque, B., and Hannigan, R. 2018. Ocean acidification alters morphology of all otolith types in 3D, delays settlement in Clark’s anemonefish (Amphiprion clarkii). PeerJ. In Review. Holmberg, R.J., Rhyne, A.L., Tlusty, M.F. Bourque, B., Wilcox-Freeburg, E., and Hannigan, R. 2016. Ocean acidification impacts on otolith morphology and mineralogy in larval Haemulon chrysargyreum. 4th International Symposium on the Ocean in a High-CO2 World. Tasmania, Australia. 3 May 2016. Holmberg R, Wilcox-Freeburg E, Tlusty M, Rhyne A, Bourque B & Hannigan R. 2015. Impacts of Ocean Acidification on Otolith Development in Larval Haemulon chrysargyreum. Goldschmidt 2015. Prague, CZ. Aug 16-21. Holmberg R, Wilcox-Freeburg E, Tlusty M, Rhyne A, Bourque B & Hannigan R. 2015. Ocean acidification and the impact on biomineralogy of fish otoliths. Ocean Acidification PI meeting. Woods Hole MA. June 9-11. Wilcox Freeburg, E., Rhyne, A., Robinson, W.E., Tlusty, M., Bourque, B., Hannigan, R.E. 2013. A comparison of two systems for dosing carbon dioxide into marine aquaria. American Society of Limnology and Oceanography: Methods. 11: 485-494. Wilcox Freeburg, E. 2104. 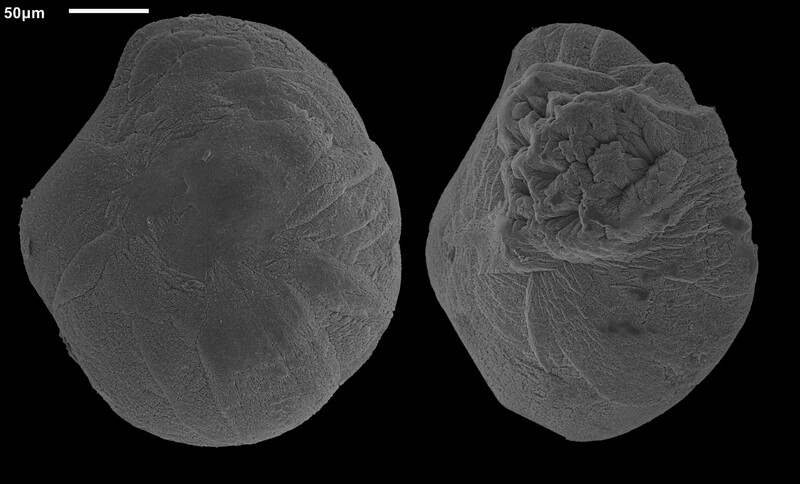 Exploring the link between otolith growth and function along the biological continuum in the context of ocean acidification. PhD Dissertation. Environmental Sciences, School for the Environment, University of Massachusetts Boston. Wilcox Freeburg, E., Rhyne, A., Hannigan, R. Laboratory Ocean Acidification Methodology using a Hobbyist Reef Tank Controller. Larval Fish Conference 2013, Miami, FL. Poster presentation. Toxins produced by bacteria in the genus Vibrio are notorious for making human sick either by direct consumption of water containing the chemicals (e.g., Vibrio cholerae, cholera) or eating shellfish contaminated by Vibrio. In Massachusetts Vibrio outbreaks cost shellfishers millions of dollars a year as the bacteria’s presence can shut down farms and aquaculture facilities. In addition to making people VERY sick, some species of Vibrio can kill larval shellfish and these Vibrios can shut down production of shellfish entirely because if there are no babies there can be no adults. As part of the Sustainable Seafood Collaboratory, a group of researchers from across the UMass campuses, we are looking at how ocean acidification will impact larval and juvenile oysters and also how Vibrios respond to declining pH. We suspect that lower pH will favor the bacteria making them more abundant and that the stress of lower pH will make the larval oysters more susceptible to the bacteria. R. Hannigan, M. Tlusty, K. Hamad-Schifferli, M. Shiaris. 2017. VAI Quick Test. MA Commercialization and Technology Transfer Office. Patent Disclosure 2018 “VAI Quick Test” (UMass Boston, Hamad-Schifferli, Tlusty, Shiaris, and Hannigan, Inventors). Lyons, C., Bustos, M., Raustad, N., and Shiaris, M. 2015. Incidence of type II CRISPR1-Cas systems in Enterococcus is species-dependent. PlosOne 10(11): e0143544. Lobsters are susceptible to bacterial infections that mar their shells leaving lesions that return even after multiple molts. Dr. Michael Tlusty‘s work on shell disease suggests that damage to the shell structure provides the ideal “breeding” ground for these bacteria. We know that lower pH changes the structure of shells and that lower pH often favors bacteria. 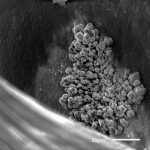 This research combines the exploration of mineralogy and structure of lobster shells and bacterial ecology to evaluate the interactive impacts of increased temperature, lower pH and exposure to bacteria. This research is funded by MIT SeaGrant. Students involved in this research include PhD student Christine San Antonio. San Antonio, C., Tlusty, M., and Hannigan, R. 2016. Integrated impacts of temperature increase and ocean acidification on larval shell development in the American Lobster, Homarus americanus. 4th International Symposium on the Ocean in a High-CO2 World. Tasmania, Australia. 3 May 2016. PhD candidate Aaron Honig and summer CREST-REU student Mary Margaret Stoll are studying how ocean acidification impacts the growth and survival of blue mussel (Mytelis edulis). They found, as we often find, that under “business as usual” CO2 conditions, larval and juvenile mussels grow little and show low survival. However at the most extreme pH (7.3) they seem to recover. Aaron continues to explore how ocean acidification will effect coastal intertidal predator-prey interactions and the dispersal and survival of mussel larvae. This research is funded by grants from the National Science Foundation. Honig, A., Etter, R., and Hannigan, R. 2016. 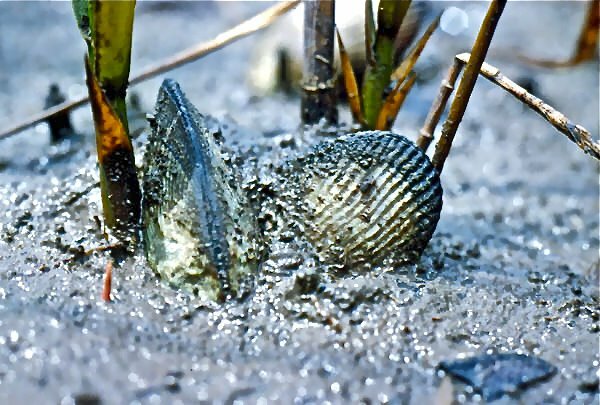 Exposure to elevated temperature reduces effects of acidification on inducible defenses in the blue mussel, Mytilus edulis, and on predation rate and predator efficiency of the green crab, Carcinas maenas. 4th International Symposium on the Ocean in a High-CO2 World. Tasmania, Australia. 3 May 2016. Stoll, M.M., Holmberg. R., Honig, A., and Hannigan, R. 2016. Effects of ocean acidification on the growth of juvenile Mytilus edulis. 4th International Symposium on the Ocean in a High-CO2 World. Tasmania, Australia. 3 May 2016. Honig, A., Etter, R., and Hannigan, R. 2015. 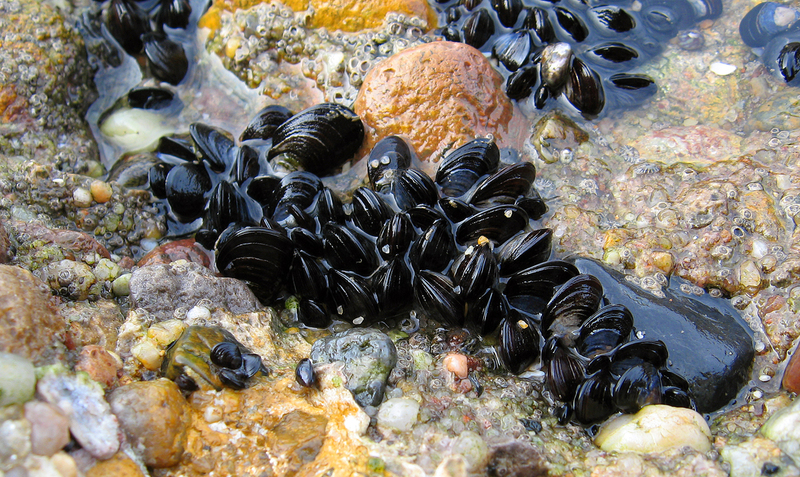 Determination of larval dispersal and population connectivity in the Blue Mussel Mytilus edulis along the Norther Gulf of Maine using Trace Element Fingerprinting. Goldschmidtt 2015. Prague Czech Republic. 16 Aug 2015. Interested in other ocean acidification research topics? Click here for a poster summarizing the OA research in the School for the Environment. 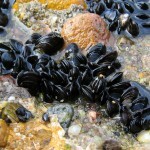 This collaborative research explores the role of across-shelf mixing in the connectivity of blue mussel populations in eastern Maine. We hypothesize that northeastern populations are seeded mostly from up-shelf sources, while a significant component of self-seeding (local retention) exists in southwestern populations. Larvae settling in intervening bays are expected to be derived from a mixture of local and up-shelf sources, with some net southwestward transport of larvae produced within the region via nearshore currents, inshore of the EMCC front. We are testing these hypotheses via a combined empirical and theoretical approach. Our part of this project tests the population connectivity predicted by the hydrodynamic models using independent empirical estimates of connectivity based on elemental fingerprinting. This research is a partnership with Downeast Institute for Applied Marine Research and Education (Dr. Phil Yund), University of Maine (Dr. Huijie Xue), and UMass Boston (Dr. Ron Etter and Dr. Robyn Hannigan) and is funded by the National Science Foundation (NSF-OCE 1333797, NSF-OCE 1458154). 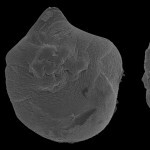 The research involves rearing of larvae in the Gulf of Maine, collection of juveniles and adults from habitats throughout the Gulf of Maine and elemental analysis of shells by laser ablation ICP-MS.
Students involved in the project include post-doctoral scholar Dr. Cascade Sorte (now Assistant Professor at UC Irvine) and PhD student Aaron Honig. Sorte, C.J.B., Davidson, VE., Franklin, M., Benes, K.M., Doellman, M.M., Etter, R.J., Hannigan, R.E., Lubchenco, J., and Menge B.A. 2017. Long-term declines in an intertidal foundation species lead to shifts in community composition. Global Change Biology, 23(1): 341-352. Honig, A., Etter, R., and Hannigan, R. 2015. 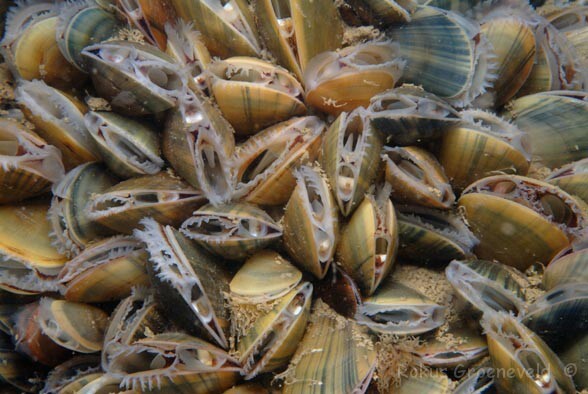 Determination of Larval Dispersal and Population Connectivity in the Blue Mussel Mytilus edulis along the Northern Gulf of Maine Using Trace Element Fingerprinting. Goldschmidt 2015. Prague CZ. Aug 16-21. Bulseco-McKim, A., Hannigan, R., Yund, P. Etter, R. 2014. 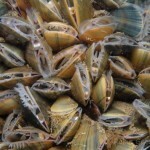 Inferring connectivity among populations of the Blue Mussel using trace element signatures: spatial resolution and larval connectivity. Ocean Sciences. Honolulu HI. Feb. 23-28. Sorte, C.J.B., Etter, R., Spackman, R., Boyle, E.E., and Hannigan, R.E. 2013. Elemental Fingerprinting of Mussel Shells to Predict Population Sources and Redistribution Potential in the Gulf of Maine. PLoS ONE 8(11): e80868. doi:10.1371/journal.pone.0080868 . Interested in other ecology research topics? Environmental life history work is done throughout the School. Check out Dr. Alan Christian who studies coastal systems restoration and aquatic ecology, Dr. Helen Poynton’s work on marine and aquatic organism transcriptomics, Dr. Gene Gallagher’s research on benthic invertebrates, and Dr. Mike Rex’s work on the biogeography of deep sea invertebrates. Faculty and students in School have been working in Étang Saumâtre (a.k.a. Lake Azuie, Haiti) since Fall 2009. The research in our lab centers on the exploration of the geochemistry of lake sediments and the study of climate change and land-use/land-cover changes on the lake’s history. Étang Saumâtre plays an important socio-economic role for the communities living around its borders, particularly in the communities (Communes) of Thomazeau, Ganthier, and Fond Parisien. Prior to the 01-12-2010 earthquake the lake had been severely impacted by hurricanes with the lake level rising 2m in 2005. The lake level has not receded. The lake itself was once a productive lake supporting fisheries and hosting significant biological diversity. Team members include former PhD students Alex Eisen-Cuadra and Katie Flanders as well as Dr. Alan Christian and his PhD student Helenmary Hotz on the land-use/land change and limnology of the lake. Hotz, H.M. and Christian, A.D., 2015. Using GIS and Remote Sensing to Analyze Lake Level Rise of Étang Saumâtre, Haiti. International Journal of Geospatial and Environmental Research, 2(1), p.6. Eisen-Cuadra, A., Herron, J., Broadaway, B., Christian, A., Dorval, E, Hannigan, R., 2013. Metal Geochemistry of a Brackish Lake: Étang Saumâtre, Haiti, in: Medical Geochemistry: Geological Materials and Health. Springer, pp. 149–166. Eisen-Cuadra, A, Christian, A., Dorval, E., and Hannigan, R. 2013. Historical trends in productivity and the role of global change in lake sediment geochemistry: a case study of a brackish closed lake. American Society of Limnology and Oceanography Aquatic Sciences Meeting. Feb. 17-22. New Orleans, LA. Christian, A. D., Hotz, H., Eisen-Cuadra, A., Dorval, E., and Hannigan, R. E. 2013. Physical and chemical analysis and productivity classification of a global change influenced brackish Caribbean lake: 2 years of data on Etang Saumttre, Haiti. American Society of Limnology and Oceanography Aquatic Sciences Meeting. Feb. 17-22. New Orleans, LA. Flanders, K. L., Eisen-Cuadra, A. M., Christian, A. D., and Hannigan, R. E., 2013. The paleolimnological reconstruction of Etang Saumatre: a fatty acid biomarker analysis of Haiti sediments. American Society of Limnology and Oceanography Aquatic Sciences Meeting. Feb. 17-22. New Orleans, LA. Mollusk shells are reliable archives of past environments because the organisms incorporate elements into their shell in different amounts and/or ratios depending on specific condi tions. These shells are well preserved in the archaeological record and we can use the chemistry of the shells as a proxy for past environmental conditions to link changes in human culture to changes in climate. Geochemical proxies for past climate conditions can be used to provide important information about a region’s past environmental history. 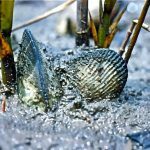 By linking these proxies to archaeological data it will be possible to evaluate the longer-term interactions between humans and natural resources in the Gulf of Maine, a region currently faced with significant changes in shellfish population distributions due to climate warming and ocean acidification. 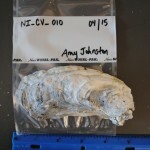 PhD candidate Amy Johnson is reconstructing the marine paleoenvironment of the Gulf of Maine using midden shells from Maine and Nantucket. These data, which include elemental and isotopic fingerprints from shells, will yeild detailed information about the climate at the time of human occupation in the sites and allow us to understand past conditions of temperature and pH thereby informing our understanding of how the system will respond to climate change in the future. To learn more about Amy’s research, which was crowd funded, visit her site on experiment.com. Johnston A, Hannigan R, Bourque B & Oktay S (2016). Paleoclimate Reconstruction of the Gulf of Maine during the Recent Holocene (Past 5000 Years) Using Archaeological Mollusk Shells. Goldschmidt Abstracts, 2016 1373. Johnston, A., Bourque, B., Oktay, S., and Hannigan, R. 2015. Paleoclimate Reconstruction of the Gulf of Maine during the Recent Holocene (Past 5000 Years) Using Archaeological Mollusk Shells. Goldschmidt 2015. Prague CZ. Aug 16-21. Significant geochemical, stratigraphic, and paleontological work has allowed researchers to establish a global stratigraphy for the Permian-Triassic Boundary (PTB) and to identify global environmental conditions contributing to the end-Permian biotic crisis. 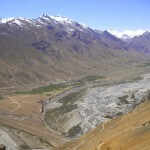 Despite the significant body of work on PTB, there are many sections such as units preserved in the Spiti Valley (Himachal Pradesh, Indian Himalayas), Serbia, Iran, and other locations that are poorly studied and the information that they contain has not been fully integrated into the global perspective that this emerging regarding this important event in Earth’s history. Since the Permian-Triassic represents the greatest mass extinction in Earth’s history understanding how climate change may have led to the extinction is critical to not only understanding the past but predicting the future. The research involves evaluating the stable isotope and major/trace element geochemistry of sections collected throughout the Panthalassa, Boreal, Neo- and Paleo-Tethys oceans in the late Permian through early Triassic. 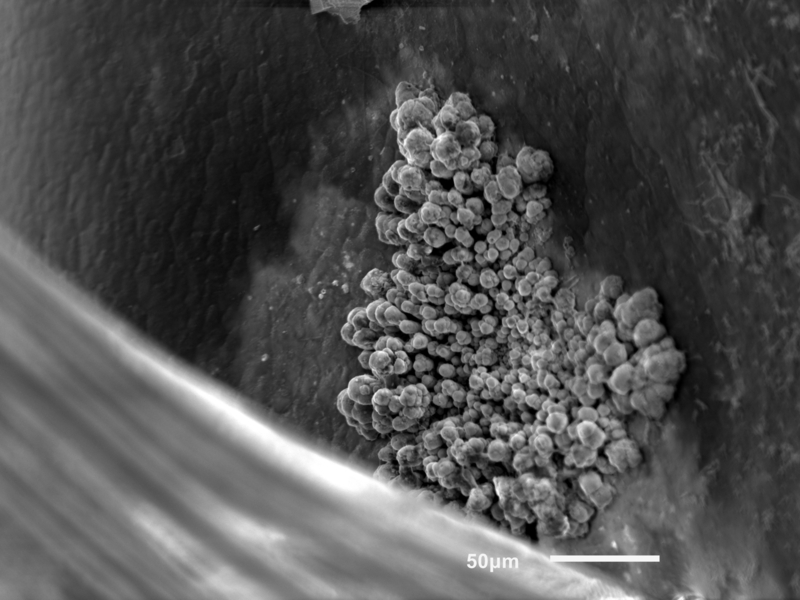 Delving deeper into the geochemistry we are specifically focusing our attention on the geochemistry of the pyrite-barite mineral system and leveraging both wet chemistry and scanning electron microscopy to better understand the evolution of anoxia in the oceans of this time period. Students involved in the project include PhD alums Jeremy Williams (2014, Assistant Professor, Kent State University) and Alan Stebbins (2018, Research Associate, UMass Boston), PhD student Steve Nye and MS student Joe Brouillet. Brookfield, M.E., Stebbins*, A., Williams, J., Wolbach, W., Hannigan, R., and Mohamad, G.G. 2018. Little change in elemental geochemistry across the marine Permo-Triassic boundary section, Guryul Ravine (Kashmir, India). PaleoWorld. In Press. Brookfield, M., Stebbins*, A.G., Rampino, M.R., Hannigan, R.E. 2018. Significance of carbon, nitrogen and their isotopic changes in a Permian-Triassic non-marine boundary section at Carlton Heights (Karoo Basin), South Africa. African Earth Sciences. In Press. Stebbins, A., Algeo, T., Olsen, C., Sano, H., Orchard, M., Rowe, H., and Hannigan, R. 2018. Sulfur isotope variation across the Smithian-Spathian boundary in the Panthalassic Ocean (Jesmond, Cache Creek Terrane, western Canada). Chemical Geology. In Review. Stebbins, A., Algeo, T., and Hannigan, R. 2018. Marine sulfur cycle evidence for upwelling and eutrophic stresses during Early Triassic cooling events. Earth- Science Reviews. In Revision. Stebbins, A., Williams, J., Brookfield, M., Nye, S., and Hannigan, R. 2018. Euxinic intervals during the upper Permian in the southern Neo-Tethys (Spiti Valley, India). Palaeogeography, Palaeoclimatology, Palaeoecology. In Review. Schobben, M., Stebbins, A., Ghaderi, A., Strauss, H., Korn, D., & Korte, C. (2015). 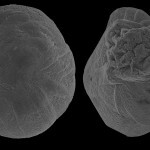 Flourishing ocean drives the end-Permian marine mass extinction. Proceedings of the National Academy of Sciences, 112(33), 10298-10303. Stebbins A, Algeo T, Hart R, Krystyn L, Williams J, Brookfield M & Hannigan R. 2015. The Early Triassic Sulfur Isotope Curve of Seawater Sulfate from Marine Carbonates in the Neo-Tethys. Goldschmidt 2105. Prague, CZ. Aug 16-21. Williams, Jeremy C. 2014. Black Shales of the Neo-Tethys: The geochemical records of the end-Permian crisis. PhD Dissertation. Environmental Sciences, School for the Environment, University of Massachusetts Boston. Stebbins, A., Holmes, S.E., Fernandes, G., Williams, J.C., and Hannigan, R. 2013. Utilizing pyritic δ34S to characterize the depositional conditions of the Neo-Tethys in the Late Permian. Fall Meeting of the American Geophysical Union. San Francisco. Dec. 9-13. Brookfield, M.E., Algeo, T.J., Hannigan, R., Williams, J.C., and Bhat, G.M. 20130. The Great End Permian Tsunamis: Recognition, Extent and Generation. Fall Meeting of the American Geophysical Union. San Francisco. Dec. 9-13. Williams, J.C>, Stebbins, A., Javonovic, D., Brookfield, N., Algeo, T.J., Berman, M., and Hannigan, M. 20103. The Geochemistry of a Newly Discovered Permo-Triassic Section in Serbia: A Tale of Catastrophic Events. Fall Meeting of the American Geophysical Union. San Francisco. Dec. 9-13. Holmes., S. Stebbins, A., Fernandes, G., Williams, J.C., and Hannigan, R. 20103. Sulfide isotope ratios as a method for examining environmental conditions leading up to the Permian-Triassic extinction. Fall Meeting of the American Geophysical Union. San Francisco. Dec. 9-13. Williams, J.C., Basu, A.R., Bhagarva, O.N., Ahluwalia, A.D., and Hannigan, R.E. 2012. Resolving original signature from a sea of overprint-The geochemistry of the Gungri Shale (Upper Permian, Spiti Valley, India). Chemical Geology, 324–325(0): 59-72. Brookfield, M.E., Algeo T.J., Hannigan, R., Williams, J.C., Bhat G.M.2013. Shaken and Stirred: Seismites and Tsuamites at the Permian-Triassic Boundary, Guryul Ravine, Kashmir, India. PALAIOSv. 28 no. 8 p. 568-582. Williams, J.C., Hannigan, R., Basu, A.R., Ghosh, N., Brookfield, M. A Multi-approach in Assessing Post-Depositional Effects on Permian-Triassic Sections in the Himalayan Mountains. In Preparation for Chemical Geology. Williams, J.C., Hannigan, R., Basu, A.R., Ghosh, N., Brookfield., M., and Stebbins, A. 2013. 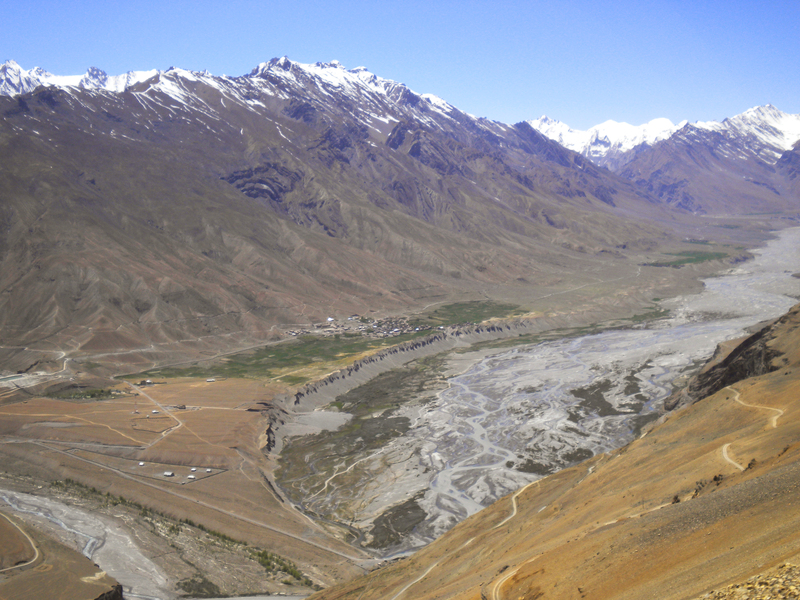 Episodic changes in the geochemical record of of the Late Permian : Spiti Valley, Himachal Pradesh, Himalaya. IGCP572 World Summit on Permian-Triassic Mass Extinction & Extreme Climate Change. June 13-15. Wuhan, China. Stebbins, A., Fernandes, G., Williams, J., and Hannigan, R. 2013. Utilizing C-S-Fe systematics to determine bottom-water oxygenation conditions of Spiti Valley Permian-Triassic sections. IGCP572 World Summit on Permian-Triassic Mass Extinction & Extreme Climate Change. June 13-15. Wuhan, China.